Shawn Stevenson: Welcome to The Model Health Show. This is fitness and nutrition expert, Shawn Stevenson, and I want to say Happy New Year. Happy 2018. Listen, I want to make sure that I can do everything in my power to see that this is your best year yet. I want you to really embrace this moment and to understand how powerful you are to affect change in your life. And right now starting with today, this is about stacking conditions in your favor, right? Getting educated on different topics, and utilizing tools that we see fit to help to empower our lives. And with that said, I'm very excited to kick things off with a conversation on a topic that I've been more and more fascinated with, and that's the topic of stress and the interesting ways that stress affects our health. Now stress is interesting because it has some really rampant effects that we are seeing today as far as these negative associations; you know, stress related illnesses. And if you look at the data, even dating back to like the 1900's, most physician visits were things like acute infection, or an injury, you know some kind of trauma, or childbirth, or things of that nature. Today over 90% of all physician visits are for stress related illnesses. Crazy, right? We don't think about that. We don't think that there's a stress component to diabetes. We don't think that there's a stress component to cancer. We don't think that there's a stress component to anxiety. Maybe we do. Maybe we do. If we really look at the stuff going on behind the scenes and just how much of a stressor sugar can be to our body, for example, and how that can manifest in insulin resistance and the associated labels that we get from there. Alright? So this all has to do with stress. bell shaped curve when it comes to stress, which we're going to discuss. But bottom line is we need stress. Stress induces growth, stress induces development, stress induces betterment, and us really reaching our full potential. We need stress to become better, but the form that that comes in, the dosage, all of those things matter immensely. And also something that I've been really fascinated with lately is the concept of intermittent fasting. It's something that I've been tinkering with for many years now myself, but I've become more and more fascinated with all of the stuff going on behind the scenes and the latest research coming out about it. And it just so happens he also has a new project that's centered around stress because he knows that intermittent fasting is in many ways this hormetic stressor, a stressor that can make you better from your brain to your blood sugar to your belly fat, alright? And this guy really knows his stuff, and sometimes we've just got to geek out. So we're going to get to that in just a moment, but the intermittent fasting, we did an episode on this awhile back, so I'm going to put that in the show notes. Really a master class on the hard-hitting bullet points about the benefits of intermittent fasting. You need to check that episode out for sure, it's really a game changer. And so just in a brief summation of what intermittent fasting looks like, this is something that number one, when you utilize intermittent fasting, you can produce more brain derived neurotropic factor protective of your neurons, literally helping to keep your brain younger longer by not eating all the time. You know, what a concept. It's so crazy when we were taught something very, very different. Also improvements in your blood sugar, right? Your blood glucose, and that management, and its kind of overall level. We see improvements in reduction of body fat, you know a change in body composition related to smart intermittent fasting, and many other benefits. But how does this play out? Well this is just having a brief fasting window in your day, right? This isn't like fasting for a week, this isn't fasting for several days or anything like that. This is taking each day, and a segment of your day, and not consuming any food during that segment, and you get all of these benefits which we're going to cover. So what does this look like? Even a brief window which could be just when you finish dinner the night before, maybe you finish dinner at 8:00 PM, and then you have a twelve hour fasting window. You just break your- you know, your breakfast, right you break your fast, having your breakfast or whatever it is, you eat again at 8:00 AM the next day. It doesn't sound like a big deal, but that twelve hour window, you get a lot of bang for your buck. When you extend that even more, maybe it's a thirteen, fourteen, sixteen hour fasting window, you get some really interesting benefits from that too. So now the issue is that this comes up against our modern kind of paradigm about what we should be doing in the morning. We were taught that breakfast is the most important meal of the day, and this is taught to us by the same people who are creating kids' cereals. Alright? Now I've got a quick story to share, because I'm thinking about my favorite cereal growing up, and this doesn't exist anymore, thank the heavens, but it was Smurf cereal. This was a real thing, alright? Smurf cereal. It was like eating I guess if unicorns were a thing, maybe it was like unicorn and fairy dust and magic altogether in a bowl. Like it was just crazy. So good, and from there transitioned Mr. T cereal. Like a lot of cartoons had their associated cereals, and my fondest memory- because a lot of times our eating behaviors are tied to emotional experiences, right? They're tied to memories. And so I fell in love with Fruity Pebbles thanks to my great-grandmother, my greatgrandmother who we called Mo-Mo. Alright, Mo-Mo. I remember spending time with her, I got to ride the senior citizen bus. It was a different kind of bus, and Mo-Mo, when we got back to her residence, she gave me some Fruity Pebbles, changed my life. Anyways, let's not even go down that path. Bottom line is it's time for us to get educated and see how we can even shift our ideas about breakfast, how we can shift our ideas about stress, and that's what today is all about. And I also want to let you know about something that's kicking off this year, I'm incredibly excited about, it's going to be a game changer for you, is what we're calling Model Mondays. Alright? Model Mondays. This is a power-packed way that we're going to be kicking off your week, and this is exclusive for The Model Health Show listeners. So every Monday you're going to get an email with three powerful things to help to up level your life. This could be books that I'm reading, this could be tips that are related to episodes of the show that we didn't get into the show, deeper information, new studies, this could be a particular product that I'm really loving at this time. You know, so it's going to be something that could add value to your life, give you some more insight, give you some tips to kick off your week, and I want to make sure that you've got access to this. So head over to www.TheModelHealthShow.com/mondays with an S. Alright, www.TheModelHealthShow.com/mondays and you're going to get access to the Model Mondays, and I promise you it's going to be a game changer. Alright? You're going to absolutely love it. We've got some really cool stuff already teed up for you for this coming Monday, so pop over there now and you're going to get access to all of this bonus stuff from The Model Health Show. Just more of The Model Health Show each and every Monday. You're going to get some information that will be featured here on the show. Each and every Monday you're going to get some more value, some more knowledge bombs, and nuggets, and resources every single week. So head over there and get signed up right now for the Model Mondays. Alright, www.TheModelHealthShow.com/mondays. Now as you know, getting access to healthy food, high quality healthy food, getting access to personal care products that are not loaded with toxins, and dangerous carcinogens that are in a lot of personal care products, which is crazy because it's such an under-regulated industry. Paying a premium oftentimes when we're just making the decision like, 'I'm going to buy healthier food. I'm not going to buy pesticide laced food, I'm going to buy organic,' it can really hit us. It can hit us right in the pocketbook and become an additional stressor. And as we're talking about today, as you're going to learn, having even financial stress or just too much stress, this psychological weighing on us to do the right thing to take better care of our health, that shouldn't exist. And my friends at Thrive Market stepped up to do something about it. They wanted to make sure that these premium products, organic and all these different categories, they have organic, gluten-free, Paleo, vegetarian, whatever kind of label that you're looking for, the very best brands though, they curate and find out the best brands and they work with the companies to get these products direct to you with no middle man, alright? So you're paying the wholesale price for some of the best stuff in the world, and I absolutely love them. I kick myself whenever I don't order something from Thrive Market, and I end up paying the full price at stores like Whole Foods, or kind of the local health food store that- you know, we love those guys, but hey sometimes it can really hit us in the pocket. And so Thrive Market is providing those same foods you'd find, alright foods, personal care products, household cleaning items, and so much more at 25% to 50% off the retail price you'll pay at a Whole Foods. Alright? Crazy, alright? And on top of that, by you being a listener of The Model Health Show, you're going to get an additional 25% off your first purchase, off your entire first purchase by going to www.ThriveMarket.com/modelhealth. ModelHealth together one word. So www.ThriveMarket.com/modelhealth, 25% off your first purchase and free shipping, alright? And you get free shipping as well. So I want you to take advantage, pop over there. You also get to see a list of some of the favorite things that I buy from Thrive Market. And again, I love them, this is stuff that I use for myself and for my family, and it saves you so much money. It's kind of crazy once you actually see the savings, it's nuts. It's nuts, really. So I want you to take advantage of it, alright? If you're not using Thrive Market yet, what are you waiting for? And folks, make sure that- you get a free membership for thirty days, alright? Thirty day free membership. Keep the membership because it's just going to keep paying you back over and over and over again, alright? www.ThriveMarket.com/modelhealth. And now, let's get to the iTunes review of the week. ITunes Review: Another five star review titled 'Best Show Ever' by Ants Asher Pro. 'I love The Model Health Show and recommend it to all of my friends. I love the way Shawn thoroughly explains things and in such a fun way. It makes learning so easy, and I look forward to what health nuggets I can take away from each podcast. Shawn Stevenson: Fire, fire. Yes, I appreciate that so much, and thank you so much for that acknowledgement. Wow, that really means a lot, and I promise you the best is yet to come for sure, and it starts with today. Alright? Today. My voice was gone the day before, and I was able to kind of nurse it back to health, and I was limping my way through with my voice, but man I was so energized in just sitting back and listening to our guest today, Ori Hofmekler, who really broke down- again this is the guy who really pushed into popular culture the concept of intermittent fasting. Like there of course are people who have been working on this research for decades, but he encapsulated it, and he's been utilizing it, and it shows in his vitality, his physical appearance. Like this guy, he's right around those senior years, and you would never know that. You know? And it's just really remarkable. And he's got a cool accent, which you're going to see, and again sometimes you've just got to geek out, and that's what today is all about. Just he's going there, and getting into this stuff, we're going to talk about mTOR pathways, stress mimicking nutrients, intermittent fasting. Alright, and again he brought intermittent fasting into popular culture. And for him- and I just want to give you another caveat, he's a proponent, as he's going to share, of intermittent fasting with one meal. Alright? Just having one meal a day. I am not necessarily a proponent of that, for some people it's a workaround, it's a great ideal but he does say utilizing important valuable things that have these stress mimicking nutrients like coffee, tea, high quality protein supplements as something that you're utilizing through the day, and not necessarily just having that one meal, but also access to those things as well. But you also have to understand that you don't have to follow any of this stuff to a T, alright? It's just another option, and you can experiment with it, and use it as you see fit for your unique goals in your life. And as you'll learn today, stress is a crucial component to creating better health, but too much can land you in a whole world of trouble. And I also want you to understand, don't let any diet or exercise program become the governing force in your life. You know, each expert is speaking from their experience and what they've found to be helpful for themselves and for the folks that they've worked with, but it doesn't necessarily mean that it's perfect for you. You know, I want to provide the best experts in the world in their respective fields to you, for you to pick and choose the things that feel good to you. Alright, but I want to make sure that you have the information, and I want to make sure that you have it from the people who actually live it, alright? And as Bruce Lee says, 'Absorb what is useful, discard what is not, and keep what is uniquely your own.' And on that note, let's get to our special guest, Ori Hofmekler. Ori Hofmekler is the author of 'The Warrior Diet,' and the first to introduce the concept of intermittent fasting in practice. A native born Israeli, he graduated the Bezalel Academy of Arts and the Hebrew University where he earned a degree in Human Sciences. Hofmekler's formative military experience prompted a lifelong interest in survival science and the biology of stress, all of which inspired him to pioneer a new area of research known as stress activated food. Alright? This is going to be some fascinating stuff today. And I'd like to welcome to The Model Health Show, the one and only Ori Hofmekler. How are you doing today, Ori? Ori Hofmekler: Very good, and pleasure to be here with you, Shawn. Shawn Stevenson: Awesome, I'm so glad to finally meet you and to talk to you. Very excited, I love your work, I love your latest book and it's really bringing bear some fascinating things we're going to cover today. But first, I want to know what got you interested in health and fitness in the first place. I want to know Ori's origin story. Alright? When did you kind of get triggered and want to learn about health and fitness? Ori Hofmekler: The very basic things that humans or animals want feel good, but for us it's feel good and look good. Since I'm a kid, I was always doing sports and challenging myself. I just enjoy it. I enjoy the challenge, the adventure, sometimes I'm going too far with this, but you know, I just don't understand how humans cannot be interested in health and fitness. It's inherent to us, it's part of us, it makes us who we are. Ori Hofmekler: It makes us look the way we look, so how can you not be interested? Shawn Stevenson: Exactly, exactly. And we were just talking about this too. You know, I feel the same way. It's just like this amazing body that we live in, this is your place, this is the only thing that you really have ownership over, and we're so uneducated about it. And we were talking about this earlier too, and I believe that partly in our culture here, it's not given a visceral understanding for folks when we take biology class and it's just this rote memorization trying to pass a test. They're not giving kids an understanding and respect and appreciation of this amazing body. So man, thank you so much for sharing that. Ori Hofmekler: You know what? I think you are very polite, you're a nice guy. I think we are anti-educated. I think even the system, they turn horrible situations into normal. Terrible diet into trivial. So people actually are damaging themselves or reducing their chance to ever excel because they accept the system or they don't even try to challenge it. So what I'd like- what I did in my books, and especially in 'The 7 Principles of Stress,' is challenging conventional thinking, bringing facts including cutting edge science that shows people they can excel so far beyond what they believe. Ori Hofmekler: I mean just think that there is a real possibility to more than double their lifespan, people can stop bouting with their weight all the time. Fitness has much more meaning than just how fast do you run or how much weight do you lift. Fitness, or biological fitness, is a test of survival. How long could you survive and can you resist the aging process? How can you mentally stay focused after hours of drill? And most importantly, what can you do to improve yourself and get better and better over time rather than the other way? Shawn Stevenson: Yeah, wow. You know what you're talking about is really a great life, you know? And it sounds- again the foundation of that is having our health and being empowered in our health. You know, on the show we talk a lot about stress, especially recently because I truly feel that people- we can over-eat our way fat, we can under-sleep our way fat, underexercise our way fat, but we can also over-stress our way fat. And this last one is not talked about enough because stress is seemingly invisible in many ways, you know, so we don't give it a lot of credit for its power. But so we look at the negative side, but I've also touched on the positive side. Today we're going to dive in on more of what that looks like, and so let's talk more about the beneficial side of stress. Let's kind of kick things off with that, and this concept of hormesis. So what is that? And let's kind of kick things off there. Ori Hofmekler: You said it right, stress is almost invisible and it's invisible because it's inherent to life. In fact, without stress there is no meaning to life, and nothing that can generate force or sustain itself on this planet. Just think about it. Newton presented correctly so the universes forces of entropy. Everything in this planet is prompted to degrade over time. Houses will decay, rocks will degrade into dust, and organisms degrade into ashes. Ashes to ashes, we know that. However life is an ongoing bout, struggle against this universes forces of entropy. These forces of entropy create ongoing stress. We are every living creature needs assistance to protect itself from this stress. But this is only one way to look at it. Only one way. The other way is the true way. This system that I show in my book, it's actually predated life itself. This system was created to allow an organism not just to survive the stress, but adapt and improve, and that's the most important thing. Shawn, right now the more you do your show, the more you change yourself intellectually and physically, you're not going to be just hanging in there. You will get better, wiser, stronger, and this is the principle of hormesis. Exposure- and that's a biological phenomenon that most people do not understand, even though they do experience it. Exposure to low-level stress creates resistance and durability to high-level stress. It sounds very familiar, but this principal is not being followed. There are also other principles. I mean instant exposure to high stress can destroy you. Ori Hofmekler: You really need to build your resistance. But one more thing, like many other phenomena of nature, stress is paradoxical. There's a special level that can only benefit you. And Shawn, this is incredible, and when you cross this threshold stress can damage you. This even applies- this principle, to toxins. Toxins that we heard, 'Oh my God, we should avoid them.' Heavy metals, MSG, arsenic, just name it, in small, very small amounts all these toxins are extremely beneficial for us. In fact we evolved biologically to live with the stress that is essential for us. Like regurgitation power, immunoradiation, so is heavy metal. We evolved in a world that was full of these toxins. But beyond [Inaudible 00:23:24], when the industry started for instance pumping in chemicals that go beyond any biological stressor to which we evolved at all, we are damaged and we are damaged severely. So when I talk in my book, 'The 7 Principles of Stress,' I provide people actually the guide for the first time how to find, how to navigate, and how to find the exact threshold that benefits you. Benefits you is literally far and beyond. And there are stressors- I just want to finish this question with this statement. There are stressors everywhere in the environment, in our physical, nutritional. In fact, nutritional stressors are the key. We need to understand what nutritional stress does to our body. It's the most important factor. And even more so there are certain kind of nutrients that mimic the effect of stress. In fact they mimic the effect of exercise on your body. This is an incredible phenomenon. This nutrient basically fell under the radar. There's a reason I believe- the reason I know why they fell under the radar, yet these nutrients today are more important to your survival and biological fitness than vitamins and antioxidants and all the FDA that you hear about. Shawn Stevenson: This is fascinating stuff already, and we're going to dive in and talk about this nutritional stress and that component, and I think it's really going to enlighten a lot of folks, but I want to just take a step back really quickly. You kind of- what I thought about when I was reading your book, is that stress is kind of like- there's like a bell shaped curve, and there's a sweet spot for stress for us to be, and a lot of us, we're kind of on one side or the other. And sometimes we're on both sides in certain areas, and there's a healthy amount of stress that we all need that many of us are not accessing, and that's what your book was so fantastic about kind of highlighting for us. Alright? Nutritional and physical stress. So I want to talk about each of those, alright? Let's start with the physical stress first. Let's jump to that side. Ori Hofmekler: Physical stress is very obvious. We already know that exercise benefits us. We know that people who exercise regularly are generally more resilient to disease and they age slower than sedentary people who do not exercise. In fact, we don't even need to know so much. The visual of it is clear. People who are trained well, they look leaner, they look stronger, they look better, and they have better energy than sedentary people. So that is very obvious. The science behind it goes far and beyond the timeframe that we thought, but biologically what happens, when you put your body under mechanical or oxidative stress, you trigger a system that's called a stress response system that compensates you for the hardship with multiplied action that improves the active organ. In this case, the muscle, the cardiovascular system, et cetera. But we have to understand that behind this, there is one factor which is over-ruling, and that factor is energy. We were trained to believe that we need energy for life. This is true, but ironically biologically it is the depletion of energy that triggers us to adapt and improve. It is the depletion of energy doing exercise, the wear and tear and breakdown of your muscle tissue that puts your body in a survival mode, triggers your stress response to adapt and improve. This depletion of energy brings us now back or down to the most important stressor, which is nutritional stress. We know that we need to eat to get nutrients and energy to survive. What the vast majority of us don't know that it's the depletion of energy not eating, fasting, that triggers our stress response system to improve us, by all means improve us. I got in my book through all the details and research what kind of genes are activated? What kind of cellular factors are activated? What transcription factors are activated? But one thing is clear. When you reach a point that you even deplete your glycogen which is really an extreme state, or big state of energy depletion, the compensating actions of your body are so powerful that you start to wake up dormant stem cells to regenerate new cells in your brain. Something that until two decades ago scientists were not aware of. Ori Hofmekler: This is an incredible process. Your body activates a system, it's called the heat shock protein response. They search and destroy, Shawn, every weak and sick cell in your body. Cancer cells that everybody has can be destroyed when you are in a state of energy depletion and full survival. This is a process called autophagocytosis when cells are being renovated within the inside. Every broken [Inaudible 00:29:52] and weak and broken cells are totally being destroyed to be rejuvenated. So think about it, you have this awesome mechanism and a state of energy depletion whether it's exercise, or fasting, or combined both which give you even stronger impact. This awesome system activates a certain kind of protein that percolates in your system to keep regenerating you and make you better than before. Not just protecting you from getting older and weaker, actually regenerating you to keep you better than when you were even younger. It's an incredible system. There's only one problem, Shawn. Most people have deactivated it all. Ori Hofmekler: You should be activating- we evolved to activate the system, Shawn, in my opinion at least half of the day. At least six to eight hours a day, humans evolved to be hungry. They didn't have access to food, they were engaging in fight or flight activity, and yet compensated at least once a day, some people say every other day. The concept is called intermittent fasting. This granted us that most of the time, all these compounds that rejuvenate your system and in fact reprogram even your fat cells to generate energy rather than to store. Breakdown rather than store. It's again an incredible system. Think that most people shut it down, shut it down by frequent meals. They start to shove energy in the big American breakfast. Then they have a power lunch, a snack here, and before they even know, they go to the health food store to buy another nice snack with some sugar inside, and at the end of the day they check themselves on their weight, or in the morning after. They don't lose weight, they don't get better. Shawn, you're going to the gym, you look to be in good shape. Honestly, when you look at people in the gym, do they really look like they're getting better? Most people look the same. Shawn Stevenson: Yeah for years. Ori Hofmekler: I've been going to the gym and I'm just asking myself, 'What the hell is going on? Why people are not improving?' Because they don't know the very thing that we just discussed. They don't know how to metabolically challenge the body, signal it to adapt, improve, and excel. Shawn Stevenson: You know, the term 'intermittent fasting'- and this is just so awesome right here. A lot of people listening- everybody listening right now, if you've heard that term, Ori is the guy who really helped to push this into culture in a way that's very practical in taking some of the science and bringing it into the forefront. So you actually get to hear from the guy. And one of the fascinating things that you mentioned, stem cells, holy moly. So we're talking stem cells- and we've done a show talking about this, and the various types of stem cells that there are; pluripotent, multipotent, adult stem cells. But to trigger the function or activation of stem cells, stem cells can become any cell your body needs, and you can trigger your body to do this process with some intermittent fasting, with some strategic controlled nutritional stress, right? And also a couple of other things I wanted to mention too. Brain derived neurotropic factor. Shawn Stevenson: You know you see an uptick in that as well, you know? Ori Hofmekler: Very good, yes. Shawn Stevenson: So we're talking about protecting your brain, keeping your brain younger. And by the way, when we talked first off about the physical stress, again everybody knows about this at this point, but not to the degree. Like you engaging in exercise, the right kind of exercise, again on that bell shaped curve, not running yourself into the ground. You get all of these anabolic benefits. And one of those that is kind of overlooked, like muscle tissue itself is a really interesting tissue in the body. It can actually store what we consider to be these kind of antiaging hormones. Like it's kind of like a reservoir you're building up. This is why people who build muscle tend to stay younger longer, alright? And it's just one of the things, Ori. Ori Hofmekler: You're touching on something very interesting and very important. It's the question of what does it mean, muscular development? Why the hell are we working out so hard? What is the main goal? Well for most people, 'I want to look good, I want to look muscular, I want to be lean.' I think being lean is like a top priority, and for a good reason, and I agree. However, how many of us are really interested in the quality of the muscle that we build? The quality of the muscle fiber, at least amongst scientists, is the key for our biological fitness. Look at yourself. You don't look to me overgrown, you look to me right at pretty much lean and fit. But most likely people who look like you also are biology people. Let me explain. If your goal is basically just to score, or to build a strong big muscle, oversized muscle, you generally build a muscle that can really score extremely strong and big. It's called a Type 2B fast muscle primarily. However, this muscle is very limited in its fueling capacity. Now this is a big limitation. If your muscle is not good, can only utilize car fuel, they're called glycolipids, fast muscle. If these are only good in utilizing sugar for energy, and not good in utilizing fat for energy, your whole body suffers a serious default because one of the basic rules of organism or mammal or animal improving, including human, is the ability to utilize fat as a fuel. The ability to utilize fat for energy rather than slow lipids back to the organ. In fact accumulation of lipids in the organ, especially the liver and muscle, is a sign of degradation and degeneration. It's a sign that a person is basically prone to metabolic syndrome if they're already not suffering from that. So when you eat, for instance, the steak with marble, the marble steak is not coming from a healthy animal. Wild animals don't have marbled meat. In fact, they're very lean. The point is, sorry for the comparison, fitness today is not defined. People do not understand the real goal or they don't want to hear about it. But in my book, I clearly show that like with all animals, our fitness goals should be very clear. Better survivability, building a body with muscle, with maximum capacity to utilize fat fuel, not just carbs. There is a certain type of fiber that you want to develop and there's a way to do that nutritionally and physically, it's called the Type 2X. The Type 2X which is a super muscle fiber, it's a fast fiber which is not the typical body builder, it's not the type to be. But it is extremely efficient in utilizing both carb and fat fuel. It programs your body now to be more efficient in utilizing fat, sustaining yourself lean, and resisting aging as you go by. So it's coming down to the last question. So what exactly are we doing? Are we going to the gym just to pump the muscle, do the bench press, and check the size of the muscle? Or are we going in order to improve our whole biological fitness? So ten years from now we will look younger, and better, and perform even better than we are now. This is the key question. I offer in my book new parameters for human fitness. Simple protocol that you can be an outlet or you can be a fitness enthusiast but adapt the new vision that you just want to build yourself to be a superior you. Ori Hofmekler: Not for now, not to go in the Olympics, but to be in the peak biological shape that you can be. Shawn Stevenson: Oh I love it so much, Ori. So let's kind of break this down for folks with intermittent fasting. What does this actually look like in a practical sense? You know, a lot of people have heard the term, we've talked about it on the show, and I'll put an episode link in the show notes, guys, where we kind of dove in and broke this down, and my own practice for a pretty long time now. But in general, you know we hear the term 'break fast,' right? Breakfast, and you're breaking your overnight fast. That's already giving you a part of this fasting window if you're sleeping. Hopefully you're sleeping. You know, everybody should know I wrote a book called 'Sleep Smarter.' It's kind of important, so make sure that you're adding that in there into the equation. But if you can extend that window, you start to get some of these benefits he's talking about. So can you break down what intermittent fasting looks like in a practical sense for people to do if they feel called to? Ori Hofmekler: In my opinion, and I've tried to prove it, the best intermittent fasting should be based on one meal a day. Quite honestly, I tried to also prove that we should eat at night. That means supper was always the main meal of humans. I'm not Christian but even Jesus said his last supper. He didn't have his last breakfast, because breakfast did not exist at that time. In the Bible it's called [Inaudible 00:40:17]. That means that maybe it was stuff in that humans used to- and if you look at King David when he was a kid and before he just fought Goliath, so he's dead, he shot him. Sent him with some food to his brother who was supposed to be soldiers with King Saul in the Valley of Ionon about to fight the Philistines where Goliath the giant was there threatening everybody. It took David the whole day, he came from the Judea area, it took him the whole day to reach Ionon I guess by foot, which is normal because people did not need to eat breakfast. He brought them food. People don't think about it but it repeatedly appeared since the biblical time. The Romans warriors used to eat only at night. In fact, Julius Caesar had centurion police almost that forbid people to enjoy meals during the day. And the Greeks used to do the same thing. So the concept of intermittent fasting of minimizing eating during the day and eating one meal a day, it's not just a nice concept of health, it has been used by people who were extremely physically engaged from the Spartans to the Greeks to the Roman warriors. I felt this myself many years ago that my performance in cognitive function increased dramatically when I don't eat. Later on, when I started university, I realized the amazing science behind under-eating and fasting. How it actually increases your alertness, puts you in a survival mode, which is exactly what you need. Improves energy utilization, which is exactly what you need. But right now we know with the science of stress that not eating turns on this stress response system to improve you. We, I believe though, should not overdo it. So in my opinion, I believe that people should eat once a day, and don't fast, and eat every other day. The reason so- two reasons. Number one, we evolved to do it this way. We live around the 24-hour circadian clock. We need to compensate at least once a day before suffering side effects. But even more so, when you prolong any stress, whether it's physical or nutritional, you are putting yourself under the risk of falling to chronic stress, and chronic stress is the worst thing you could put yourself under, Shawn. So extending fasting to every other day as a routine, or every three days like fasting three days as a routine, I believe is a big mistake. If you go too long, it creates emotional stress. We never evolved from that and it doesn't bring you any benefit beyond what I just described. I clearly say in my book, and show that every stress to be beneficial must be intermittent. You cannot just prolong any stress. Just think about even the radio that you like puts you under stress, it's created stress, it's great. It puts adrenaline, you create, and you achieve. But what if somebody just put you now for a week like this standing like this next to the mic and drilling? That will crush you, Shawn. Same beneficial stress prolongated. It has to do simply with the way we evolved. Our endocrine system, the brain controls the most important response to stress that we have. It's called the fight or flight response. It's the most critical response to primal survival because if some kind of a danger happens, or a basis about to create- even more so a human being is threatening you, or war, or some situation of fire that you need to fight or run away. This system helps you react properly. Problem, the system never evolved to be activated for a prolonged period of time. It evolved to be strong, fast, swift reaction. So when you see fighters in the ring, correctly so, they're usually coming in a bout that's divided into three up to five minute rounds. Five minutes in maybe UFC, or MMA, and three minutes in boxing. Gives you enough time to somehow do these intermittent bouts that you are dealing with. Once this is prolonged beyond a certain threshold, we are facing a problem. The fight or flight response becomes dysfunctional. Shawn Stevenson: You know, this is again pointing us back to the fact that we can utilize stress for our benefit, but at the same time to be mindful that there are levels to this. And so somebody going from three meals and three snacks a day to eating one meal, there's quite a jump-off right there. Shawn Stevenson: You know, and so what I would recommend people to do, and I know Ori would say this as well, but is to kind of transition yourself. You know, get yourself acclimated. And so for myself personally, and by the way this is an incredibly effective way to lose fat because your body is going to continuously pull off of that food that's coming in. Why would your body do the arduous work of breaking down stored body fat for fuel when there's new food coming in all the time? Ori Hofmekler: All the time, yes. Shawn Stevenson: So actually this is a logical thing, and again we've been trained that this is the way that we're supposed to eat. But the reality is this, for myself personally, I'm one of those people that- I lose weight pretty quickly, and so making sure that I'm getting enough meals in that window, or enough food, but still stretching that window out to get a lot of the benefits that Ori is talking about. Maybe not all of them because I'm not doing just that one meal, but my fasting window might be from we'll say 7:00 PM at night until 8:00 AM the next day. And even- you know there's some stuff coming out, and I want to talk to you about this if you're seeing any of this science out there that's showing that even having coffee or like herbal tea can kind of change the system and not get that full effect of the intermittent fast. So I'll break my fast with the coffee, with some Four Sigmatic coffee, and some MCT oil, and all that good stuff, but I'll stretch it out. I used to do it earlier. Ori Hofmekler: Yeah, please describe what you eat for breakfast because I'd like to talk to you about this. Shawn Stevenson: Sure, sure. And so again, my fasting window- I mean my feeding window might be from 8:00 AM until- I'll be done, I have to be done by 7:00 PM in the evening, and that's giving me a nice thirteen hour window of a fast. And so I usually just have the coffee with some MCT oil, and I'll hit the gym. And so I'll work out, and I might not have so-called breakfast for another two hours or so, so it's getting close to 11:00 AM, and then I'll have a lunch and a dinner in there as well. Ori Hofmekler: So your main meal is mid-day. Your main meal is mid-day? Shawn Stevenson: My main meal is dinner. Mid-day meal isn't much. Ori Hofmekler: And what time do you eat dinner? Shawn Stevenson: Hopefully if things are working out well, if it's according to plan, 6:30 PM. Ori Hofmekler: Okay. Let me add to some of this stuff. So I disagree, in fact coffee is totally complimentary and so is MCT. Totally complimentary to fasting. In fact you make fasting even more better, there's a lot of science. In fact, coffee mimics the effects of fasting. There are certain kinds of nutrients that mimic the effect of fasting and exercise on your body. There's nothing wrong with eating these nutrients. Shawn, I mean people don't understand, when you have these stress activated nutrients, some of them fell under the radar, some that are most important. Most people [Inaudible 00:49:35] but many of them still exist in our food. So listen to that, how about you eat blueberries, they taste sweet, they give you natural and pure sugar, but this does not raise your blood sugar. The post-prandial effect of blueberries, or even green tea or coffee, is a reduction of blood sugar. In fact if you eat something with blueberries, enough polyphenols in blueberries reduces the blood sugar, and same in all berries. Strawberries, raspberries. There's research done on grape pomace. If you eat grapes, not the industrial or GMO without seeds, with the seeds and the pomace. The great pomace has shown to significantly reduce post-prandial after meal blood sugar and lipids. Now Shawn, you know that this is the number one factor for diabetes, obesity, and aging is the post-prandial elevation of blood sugar and blood lipids. So for people who eat frequently, every time they finish or after the meal, breakfast, lunch, a power snack, and then dinner, and then late dinner, this elevation of bad sugar and lipids that overall have accumulated- it's an accumulative factor that leads to metabolic syndrome, obesity, and diabetes. It explains why modern men are so vulnerable. So the point is what we generally don't know that many nutrients that are hidden someplace, even in the supermarket, don't work like the regular food that we eat. You can eat it when you under-eat during the day. It compliments fasting, and that's why I put berries as a very desirable food. Good grass-fed whey contains nutrients that mimics fasting, and basically some kind of fruits have it. You minimize your eating but you don't need to starve yourself. You actually compliment your body by giving nutrients that strengthen your insulin, prevents a blood sugar spike, make you lean down even more so. So your routine actually, when it's reaching the breakfast, it's just perfect. Not only that you fast, you put coffee that mimics fasting. Coffee does other things too. Shuts down your hunger, activates cellular effects that improve your brain capacity, and your protective capacity. And then you exercise, as you described. You [Inaudible 00:52:26], that's stress principle number two, maximum impact. You deplete through your glycogen because you really should be exercising on empty. So by the time you finish your exercise, you're in the peak energy depletion, your body is in a peak survival mode, if you can pull this- and it's not easy, instead of shoving food, recovering immediately, pull that- push that for another hour or two, you just got great beneficial factors percolating in your system. So then when you eat the meal, you cannot get fat after such depletion. That's part of the stress principle. Energy depletion overrules any other factor. In fact, you become even resilient to sugar itself, and sugar is the worst thing you can do. But when your glycogen is depleted, your body can tolerate even sugar. So I believe your intermittent fasting is right because it works for you, because you feel it, you experience it. There's no steady rule, but the one thing you should avoid, and I'm saying it to everybody, do not go under a theory if it doesn't work. Don't put yourself under stress that will crush you. Do not over-fast, do not over-train, and every time that you're under enormous stress or anything, stop and try to break it down. If you feel that something is prolonged, try to break it down either by a bout of exercise, go out, breathe air, talk to somebody that you trust. Don't let anything manifest or percolate inside you for too long. Shawn Stevenson: Perfect. Thank you for sharing that. You know, and just pointing people back to basics, you know? Back to paying attention to your body and listening to your intuition, thank you because these are all- these are great best practices, and getting people educated. And I want to talk more about stress mimicking nutrients, but I want to share one quick thing, is that I remember the first day that I came across this work, and the studies about intermittent fasting. This was probably- oh man, maybe nine years ago. And I'm a guy that I want to experiment, I want to find out. stuck with it and I think I had like some Yerba Mate tea or something like that. And you know, my blood sugar was a little bit wonky, but I'm totally- your body adapts, and I got adapted so quickly. And today, like I go and I'll do 400-pound deadlift, and bench pressing, squat jumps, lunges, all this stuff, box jumps. I'll do these incredible workouts just from having some coffee, and I don't even think twice about it. And afterwards, and this is a cool thing about like when you're really doing like- especially with high intensity interval training, you're not hungry afterwards. Ori Hofmekler: That's very true. Shawn Stevenson: What's so crazy, when you really put that intensity into your workout, and so I could literally go another couple hours without eating. I tend to not do that, you know it might be an hour later or something like that, but I just want people to know that if this is something you're interested in, again there's like an on ramp. Put the training wheels on first and find out what happens. But I want to talk more about stress mimicking nutrients, and we're going to do that right after this quick break. So sit tight, and we'll be right back. Alright we're back and we're talking with the one and only Ori Hofmekler about this fascinating topic of stress, and his principles of stress, his new book, and I absolutely love it. And again, he's somebody who really helped to push into public consciousness this understanding of intermittent fasting and the benefits. So before the break we were talking about stress mimicking nutrients. So again, let's kind of recap what is that exactly? And what are some of those stress mimicking nutrients that we can take advantage of? 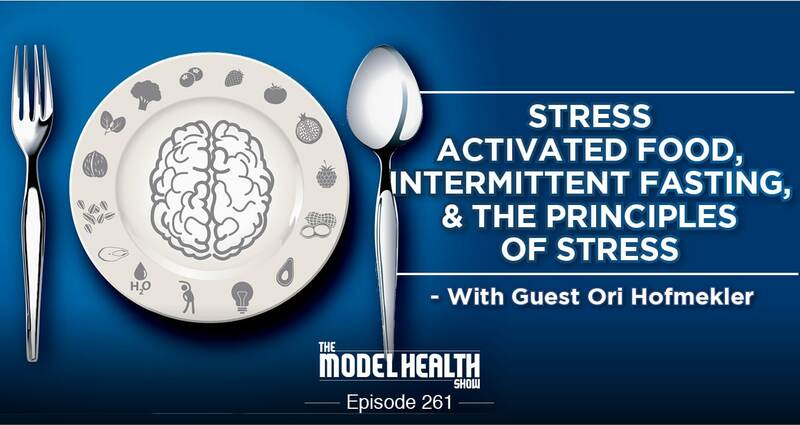 Ori Hofmekler: Stress mimicking nutrients are what I call nutrient of stress activated food, a nutrient that mimics the effect of exercise on your body. They give you the same benefit actually of fasting and exercise on your body, they activate the same genes, they trigger your ability to respond, they trigger your stress response system, they can trigger this heat shock protein response which I discussed before that it helps search and destroy every weak and sick element in your body. Some of these nutrients, if you look at the cutting edge research, have shown to reverse Type II diabetes. Some of them like blueberries for instance have been shown to be more effective than the drug Metformin. So we evolved in a world that was very primarily based on the lower food chain where humans consumed many of these nutrients which were inherent to the lower food chain. But today, many of these nutrients were removed out of our food chain because they inherently appear [Inaudible 01:01:29] that we don't consume anymore. Traditional herbal medicine do extract some of these nutrients, and they have a healing effect, but the ignorance about this is stunning. Most people have no idea that they exist. What we know is the food pyramid, arguably correctly or so, the FDA writes the food pyramid and how much vitamins and antioxidants we need, how much B1, B2, B3, whatever it is. What people don't understand that the biggest missing link in our nutrition today are these nutrients. Now here's what happened, Shawn. We evolved in a very stressful world. That's the way it is. I mean, primordial world, you sometimes could not even cross childhood. The dangers, exposure to dangerous beasts, famine, and hardship, extreme climates, I mean really pushed one rule, the survival of the fittest on the fittest could survive. But it's not just us or our ancestors or the animals, plants too. The food that we ate was stressed, and as plants are stressed they produce molecules that protect them from the stress whether it's predation, a pest, or heat shock, or cold shock. The plants and the animals produce molecules that protect them. These are the stress activated nutrients and these are the nutrients many of them mimic the effect of exercise on our body. When an animal or a human eats a stress food that is widely grown, they generally benefit from the same nutrient that protects the plant, would protect the human or animal that eat them. It's an incredible phenomenon, and as I said these nutrients, many of them are missing today. And they're more critical to our survival in a society that the vast majority of adults are now suffering from overweight, or obesity, or diabetes, or metabolic syndrome. These nutrients can resolve it. Now why don't we see them? Because if people had an exercise system- and by the way, I did a research project on that, and that's how I came into that, it's called SAF. If you want to see some research about these nutrients, go to www.SAF.org or at www.DefenseNutrition.com you can find the link to SAF. I was intrigued and I believe that some of the scientists I've been associated or working with are extremely now intrigued with the idea that we are missing a huge potential of our ability to excel, but not understanding this theory of stress nutritional stress activated molecules. Why the industry is not using it? Because it's threatened our corn industry. When you have the knowledge of SAF, when you have the knowledge about intermittent fasting and how to excel, upgrade your physical fitness and maybe even become resilient to aging to the point that maybe you can double your lifespan. I do believe it's possible. You would stop using 90% of the products out there. Morning cereal will disappear. Somebody will have to renovate the industry. I'm not saying it's impossible. I myself now am on the side doing a lot of experiments to conquer the bottom of the junk food chain. Yes, create cookies that really fit human biology, that look and taste better than regular. Create cereal, create granola, create even ice cream that fits. I believe that somebody- I'm not selling, I'm just creating models, because I'm so interested in offering real solutions. It's not just talk. So stress activated food, you can find them- basically stress activated nutrients and nutrients that mimic, you can find them again in all wild berries, in all grown plants, and animals that live on wild plants like grass-fed pasture raised animals. Goats, sheep, and grass-fed cows produce milk with compounds that are extremely beneficial to your case. They also help you resist stress. These animals are stressed. Grass-fed animals that are pasture raised are stressed. They're out there the whole time, they graze, sometimes during the off-season there's not enough food so they under-eat. Many of them produce even less than half of the milk of grain-fed factory cows and animals. However, I mean the milk itself is so much more nutritionally advanced, there's no comparison. Ori Hofmekler: So I say wild grown plants and animals living on wild grown should be product, should be your prime food, including eggs from free range chickens. On the top of these nutrients I believe barberry, which we derive it from the back of trees, certain kind of [Inaudible 01:07:37] is the king. Every research shows that it mimics the effect not just of exercise or fasting, it's a potent inhibitor of mTOR, the mechanism as an adult can drive the aging process and even cause cancer and degrade your body. Shawn Stevenson: So let's talk more about that, Ori. Let's talk about this mTOR pathway, and give people a little bit of insight on that. Ori Hofmekler: With mTOR is a mechanism that again, like many paradoxical phenomena of nature, benefits you. You're going to die without it, but when overly activated, it would kill you. That simple. But it becomes more pronounced when you look at younger people and adults. When you grow mTOR plays a critical role, essential role in helping you grow. It's a growth mechanism that builds your bones, and muscles, and everything that grows. However, when mTOR is over-activated or over-stimulated in a non-growing body, you and me right now are not growing, we're adults. When it's over-stimulated in a non-growing body, it can cause aging of cells and tissue and cancer. Plain and simple, it absolutely degrades your whole metabolic system. It becomes- it turns insulin receptors, and leptin receptors, [Inaudible 01:09:08]. It just impairs the whole system. Enlargement of cells and tissue is not a good thing. It's a sign of aging and degradation. So why do we talk about it? Because the main stimulator of mTOR, most of it is food. And certain kinds of food are very potent mTOR stimulators. They can benefit children when they grow, but as you get adult, this mTOR stimulating food, you should avoid them. You should minimize the consumption. You don't want to overdo it. It's how much energy you put in your body from food, and what kind of food that you eat. The number one stimulator of mTOR, if you ask me, is sugar. Anything that fast releases energy would stimulate mTOR, and when you overdo it, it will obviously stimulate mTOR. So any kind of food that combines sugar with starch, or sugar with fat, or sugar with anything, will obviously [Inaudible 01:10:20] if you eat it frequently or too much, you really put yourself on a very high risk not just to gain fat, to degrade your infrastructure, to enlarge your fat cells, to create growth- unneeded growth in a growing body. Again, when you look back at the early food chain, it was very well balanced with very little to no stimulating food. Most of our food came from non-glycemic nutrients or from food that is anti-glycemic. They call it anti-nutrient, like berries. Berries have polyphenols, we don't have enough time to get to the science, but it's stunning. It's so exciting to see that. Polyphenols, when they go to very high molecular like 300k basically, can bind or inhibit enzymes that break. So you eat the sugar but you've evolved to not utilize it, and definitely not in excess. That's the kind of food chain that we've evolved to be in. Very low glycemic, very noninsulin spiking, and very nutritious. What we turned today into is food that the vast majority is processed, depleted of these nutrients, very glycemic, and addictive. Our food and the industry makes it more and more addictive so we can buy more. What we do now, we live in a system under eating food produced by the industry; food that makes us old, fat, and sick. We should stop doing it, and the first thing is knowledge. Ori Hofmekler: It's what you do. Shawn Stevenson: Oh yes, thank you, Ori. You know what? It just came to such a simplistic point, you know like these things are doing this to us, we should stop. Alright? The cereal industry, Lucky Charms, Trix, oh my goodness the memories. But you know, if these things are hurting us, maybe we should stop, you know? And the great news is people like yourself and myself as well, we're really pioneering and helping to spark the minds of people who are creating products and flavor sensations and enjoyment from food that meet the prerequisites that you're talking about. recall- I don't know where I saw you talk about this, maybe this was in the book as well, but curcumin is another one. Ori Hofmekler: Yes. Curcumin is very powerful, yes. Shawn Stevenson: That's one of the reasons today that I'm able to talk a little bit better than yesterday where I was like whispering, is I went really ham on a concentrated formula with turmeric and curcumin, and it really helped with inflammation the next day. But I didn't know that I was actually giving a stress mimicking nutrient to my body, and it makes sense. Like once I understood about this concept, it just became so obvious of how certain compounds really have this prolific effect on the human body once we utilize it. And we see cultures that utilize something like turmeric to a great degree, and you see less incidents of cancer for example in other populations. Ori Hofmekler: Absolutely. These nutrients are toxic to cancer. When you put them, you basically make your body toxic to cancer. Cancer cells thrive on sugar, they definitely don't like stuff that inhibits a mechanism that makes cancer flourish. In fact, all you want is to give cancer cells something that normal cells should do. It's called apoptosis. Cells are supposed to commit suicide. Listen, this is not a democracy here. Not everybody has the right to live. In your body, a cell that is dysfunctional is supposed to commit suicide and die. Wrong. Absolutely wrong. We evolved to constantly- we have all the systems to search and destroy and kill and recycle all the weak and sick cells in our body. If we fail to do that, we can become not only aged, we can develop tumors and cancer, so we need this system and this kind of nutrient that we just talked about helps you search and destroy, activate a system that destroys the weak and sick cells that everybody is prone to have in their system. So you're right, you're doing the right thing. And I believe- and I wrote about it in my book, I believe that even predators who are not vegetarian have the instinct to search for these nutrients. I don't know if you have dogs, we have dogs and cats we rescue, and I can tell you both of them are ferocious predators and they're doing very well. We've got some big pit bulls and a cat that is almost eighteen years old. Ori Hofmekler: Still hunting, but all these animals amazingly are attracted to grass. The dogs like to eat grass and does cats. Dogs actually like to chew bark of trees and everything bitter, pits of olives, we have olive trees here, and even eat them. They are looking for soft nutrients, that's the only explanation. They are looking because the estrogen and bitter taste of stuff. Yes, mark the presence of these nutrients. So predators who are not vegetarian, crazy, crazy on grass. I mean, I cannot even stop my dogs from doing it. And my cat, I have to buy him wheat grass or barley grass so he can eat it too. We have this instinct too, but it's all been crushed out of us with sugary and greasy things. We've got to build it again. Ori Hofmekler: The craving for nutrients, the intake of them, and the understanding of what's good and what's bad. What are the triggers that make us biologically fit, and reprogram our system to resist aging, hardship, and disease. Versus what are the triggers that make us fat, sick, and old. Use one, avoid the other group. Shawn Stevenson: There it is. Ori, this is so fascinating and just very grateful for your work, and for your articulation, and wow just insights on top of insights. And even thinking about the action of your dogs, just like that's so mind-blowing and interesting. Man so if you could, I've got one final question for you, and this is kind of a big picture question, and I would like to know this personally as well. What is the model that you're here to set with the way that you live your life personally? What is the example that you're here to set for other people? Ori Hofmekler: Wow, what a question. Okay, I believe that people should- the model should be a stressed human being, but I'd rather use the name challenged. You deliberately and knowingly challenge yourself to keep improving and exceling. And I believe there is no peak to this, maybe there's a biologically peak, but each of us needs to search for that. For me, many things are too late. I just learned it too late. Still for what age I am, I believe I'm in relatively good shape for [Inaudible 01:18:30]. And in many ways physically I still perform with people who are thirty or forty years younger than I am pound for pound. But that's not the point. The point is life is exciting. We don't even know how great it can be, and we don't even know how long we can live. I mean I have this chapter in my book, it's very important not just on nutrition, on sexuality too. We can delay sexual aging, not just male, female too. There are ways to do that, and it has to do with following the stress principles. There's already evidence that organisms under stress of the same species delays sexual aging to the point that they can still reproduce in ages that years ago, they were expected to finish and die. And think about it, why do we age and why do we age from dying? Because nature has no reason to keep us alive. Biologists believe that natural selection for this also when you cannot contribute to the future generations of your species. So they say, 'Well when you lose your robotic capacity to reproduce, nature is ready to give up on you.' But I think it's more than that. I think it's a contribution to the future. You can see many anecdotal empirical evidence, it is a book by itself, of all people- considered all, grandmother who raised the children alone. Raising the children may keep them young. People who decide to work at an old age or have a dream to finish, it keeps them young. So keep things young. I also believe that we don't have to die old. Yes, we can live to an old age, but we don't have to die from the typical old age related diseases. We don't. We can live long but die like young people do from non-aging related causes such as accident, injury. Hey young people die, it's tragic, but not from aging related diseases. So that's my model. A person who keeps challenging himself to keep improving, extend his life, improve the quality of life, and manage not only to change the way he lives, but also change the way he expected to die. Die like a young person, not like an old person. Shawn Stevenson: Boom, powerful. Ori, thank you so much for your brilliance, and I want to thank you for challenging yourself to create this work, and to put it into personal practice, and to share it with the rest of us. Truly inspiring. Shawn Stevenson: Can you let everybody know where they can find your book and connect with you online? Ori Hofmekler: Yes the book is available at www.Amazon.com. 'The 7 Principles of Stress' by North Atlantic Books. And more information of stress activated foods that we discussed, SAF, is www.SAF.org or www.DefenseNutrition.com. You can also log into www.OriHofmekler.com and even more importantly go to my social media, Ori Hofmekler, or Defense Nutrition, or Warrior Diet on social media. I can interact with you, I'll be happy to do that. Shawn Stevenson: Ori Hofmekler, everybody. Thank you so much. Ori Hofmekler: Thank you Shawn, I enjoyed this talk. Shawn Stevenson: Alright everybody, that was Ori Hofmekler, and I hope you got a lot of value out of this episode today. Now this is about, again learning from the experts, learning from the best people in the world in their respective fields, and extracting the things that feel good in your own life. Alright so- and this is just scratching the surface on what we're going to be providing this year. But I wanted to kick things off with a conversation about this tool that you're going to be hearing so much more about in popular media, and really kind of get ahead of the curve. And this is the relationship between the benefits of stress, and this kind of bell shaped curve, and how stress is not just something that can take us down and cause all of these problems metabolic and otherwise, but also the benefits that we can get by getting the correct dose of stress, because we need it. It's a catalyst. We need that catabolism to activate the anabolism, if that makes sense. Alright? So I wanted to really get you some information on that, but also again make sure we're kicking off Model Mondays. Go to www.TheModelHealthShow.com/mondays and each week on Mondays you're getting more from The Model Health Show. Three special pieces of content that is going to help to propel you each and every week. Alright so pop over there, and get access to that ASAP. We've got some incredible show topics coming up, and some incredible guests. I'm telling you, it's going to blow your mind, so make sure to be ready. This is your year. No more playing around, this is time to execute, alright? It's time to focus in, it's time to get yourself around that empowering information to support you in your vision, and again it's time to execute. This is your year. Hi Ori! I used to work out with you at NYHRC in New York about 20 years ago. You were in great shape at that point and you have obviously shared your wisdom and journey through your writing. I’m so glad to you have been re-acquaited with you at this point. Congrats on your success and I look forward to reading your book. Keep it up brother! WOW! This guy blew my mind. Thank you for having him on your show. I need to listen to this about 10 more times.